With the demise of Caran D'ache Amazon Green, I have been on the lookout for another green that I can love as much. 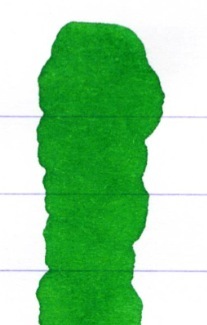 Maybe Ultra Green from Diamine is it. I tested Ultra Green on a variety of papers including famed Tomoe River Paper. While I have some issues with Tomoe River Paper (it crinkles like mad and needs to be treated gently for this reason), I also think it is fantastic to get a true read of the color of an ink. Rather than being absorbed into the paper, the ink seems to sit on top of the paper - there is never even a little bleed-through or feathering with Tomoe River Paper. I love the clear and crisp qualities that this ink has to offer. Great clean green with good saturation (so important to me) and even a little shading. In some ways, maybe I like this ink even better than Amazon from Caran D'ache. Look at the highlighting test and the smearing (well, the lack of smearing). I love the swab below. The variation of color . . .
Yep! This might be my new green - might have to do more testing first, though, yes? Do you have a favorite green? Tell me all about it!